Beyond the introduction of cereal bars and the occasional reheated curry from the night before, breakfasts haven’t changed that much over the years. The Jolly Giant, the Lensman, the Flame Haired Squelchie and I have therefore been seeking out the more unusual and inventive breakfasts available in London. The breakfast menu at Alan Yau’s budget-friendly Chinese diner, Cha Cha Moon on Ganton Street, had promise, but given its inconsistent quality I wasn’t surprised when it was pulled mere months after its introduction. I’ve therefore been looking forward to breakfast at Dishoom for some time. Based on the Irani cafes in Mumbai run by Iranian immigrants, Dishoom’s small lunch and dinnertime menu of biryanis, rotis and grilled meats have proved so popular I’ve had trouble getting in some evenings. Fortunately for me, Dishoom was almost empty on a brisk January Saturday morning. Dishoom’s interior is a world away from the depressingly chintzy decor of most Indian restaurants. 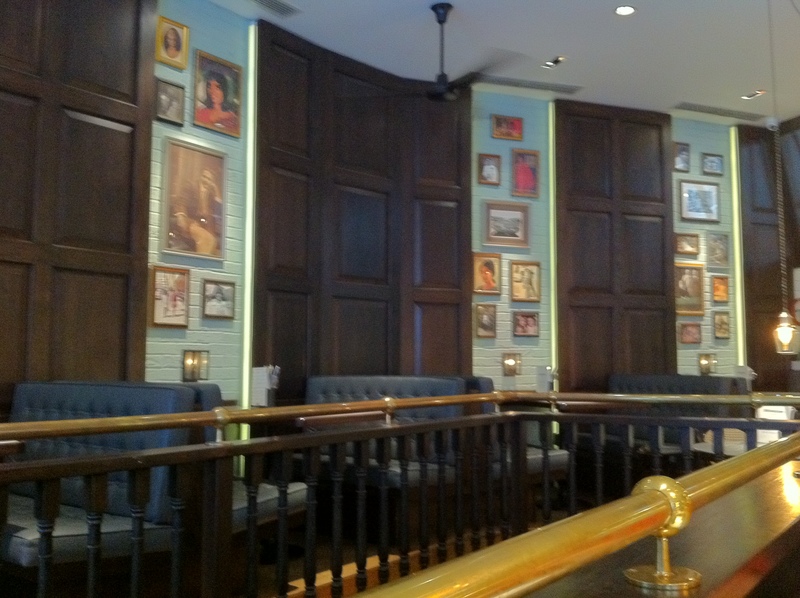 Plush booths line the walls which are dotted with faded family photos, while ceiling fans whir over head. A liberal use of dark wood panelling and mirrors gives the place a spacious, yet simultaneously cosy feel. Unfortunately, the tiled floors means it’s likely to get very noisy when packed to capacity. Having visited Dishoom on a whim, I didn’t have enough time to round up the usual four-member breakfast club, so I enlisted the Euro Hedgie as my breakfast companion. I warmed myself up with a hot glass of the house masala chai. Initially concerned by the rather sedated aroma, my worries were allayed by the intense, but not overpowering, spicy kick of the milky tea. An instantly satisfying drink, perfect for a cold January morning, its puts other masala chais available in London to shame. The house masala chai. I really like it. The cold seemingly didn’t bother the Euro Hedgie as he opted for an icy Thums Up instead – a popular Indian cola which I found less fizzy than Coke, but also more cloyingly sweet which the Euro Hedgie liked but I could take it or leave it. 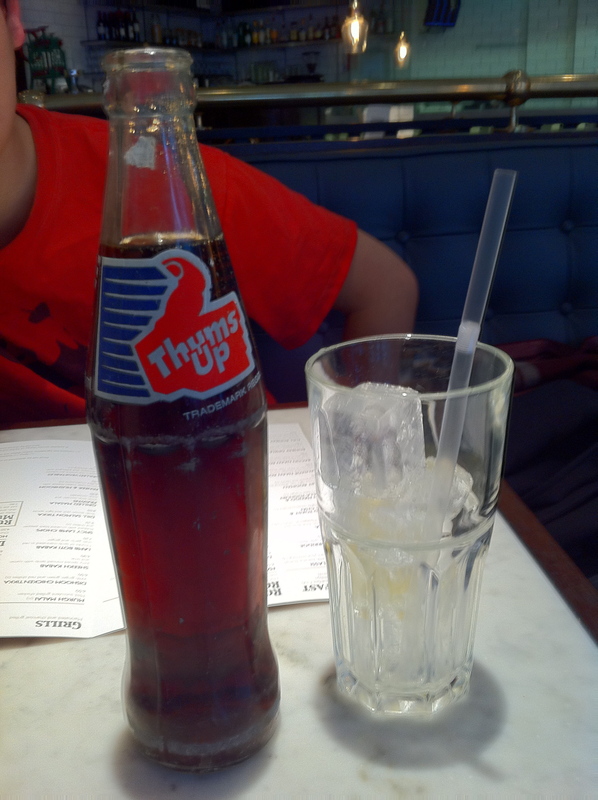 Thums Up cola. Tastes good, even when served warm, according to the Euro Hedgie. Opting for a lighter start to the day, I went for the Fruit Roomali, a roti filled with raspberries, mango chunks, honey and mascarpone. The bread was suitably filling, while the fruit tasted fresh, delightfully juicy and was served at room temperature too, rather than chilled to a flavourless death. The small drizzle of honey wasn’t as sweet as I’d expected, which is either good or bad depending on how you like your honey, while the mascarpone wasn’t as creamy as we would have liked either, almost resembling yogurt. The Fruit Roomali at Dishoom. The Euro Hedgie had similarly mixed feelings about his Bacon Naan Roll. The bacon was cooked just the way he liked it, slightly chargrilled but not too crispy either, with dribblings of meat juice soaked up by the doughy soft naan. There wasn’t enough coriander for his taste though, while the chilli jam on the side was found wanting with the spiciness too subdued and the sweetness likely coming from added sugar rather than preserved fruit. 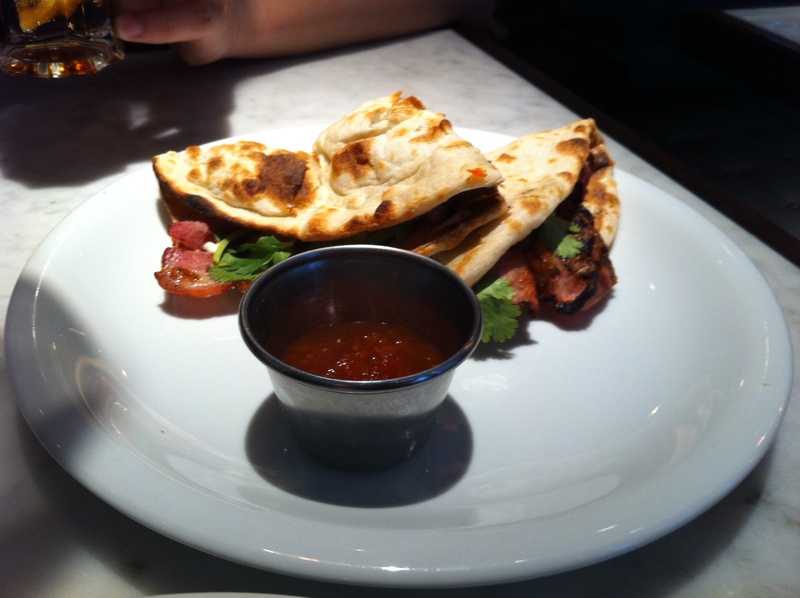 The Bacon Naan Roll at Dishoom. Undoubtedly impressive was the effortlessly polite and efficient service. There’s free WiFi too. I have mixed feelings about breakfast at Dishoom. The decor is pleasingly different from the norm, the service can’t be faulted and it’s not too pricy. Overall, the food is pleasing and filling, but quality was inconsistent and, perhaps most disappointing of all, didn’t feel especially distinctive. 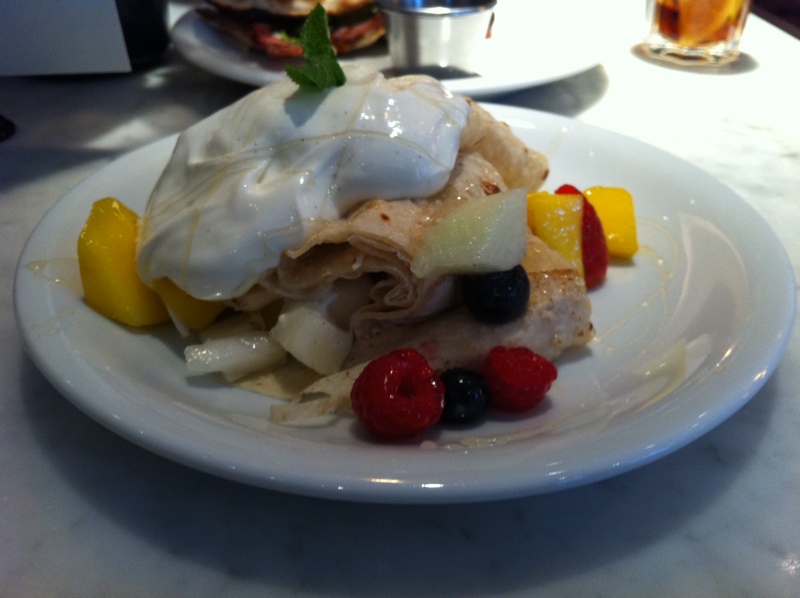 The Bacon Naan Roll felt a bit too anglicised, while the Fruit Roomali, with the roti replaced by a crepe, could probably be found, in some form or another, across the Channel with ease. Not what I was hoping for given Dishoom’s Irani cafe roots. 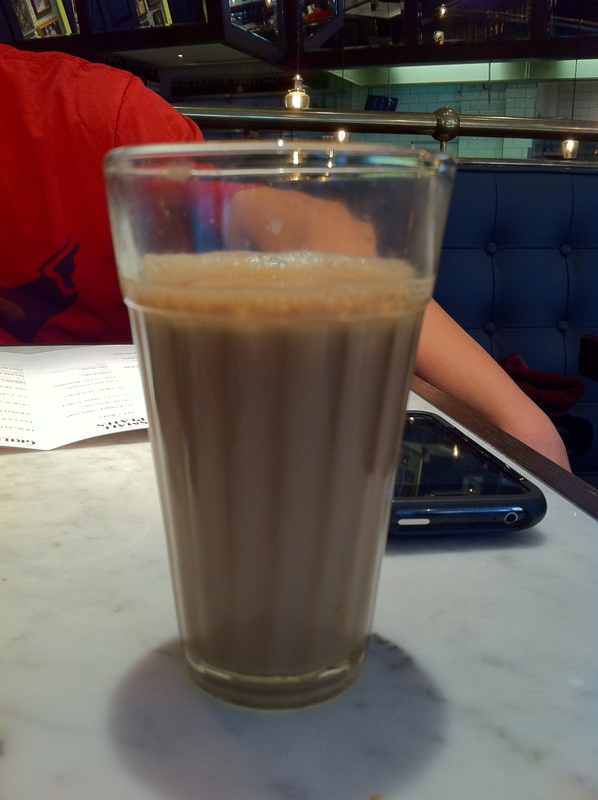 Still, I’m willing to go back to give Dishoom a second chance, if only because of the tongue tickling masala chai. Tags: alan yau, bacon, breakfast, cha cha moon, chinese, cola, dishoom, fruit, indian, london, mango, masala chai, mascarpone, naan, raspberry, roti, tea. Bookmark the permalink.